Shown graphically as a pie chart it looks much like this. Depending upon the knowledge, experience and expertise of the buying influence, the size of each slice of the pie chart will vary. Some sections will be larger than others. The size of each slice doesn’t really matter. What matters is what each slice of the pie is telling you about the buying influence and the appropriate approach to take. Let’s look at each slice of the pie. Every buying influence has an initial understanding of their situation or context. In short they have a brief list of situational outcomes they want to change—something they wish to accomplish, fix or avoid. Often a trigger event has drawn their attention to previously unseen issues. They may have made an initial assessment of the size, scope or urgency of the problem or need. The buyer may have researched the web, talked to co-workers, read blogs or seen product literature. They may also have experience with your product, service or solution and have preliminary judgments of how your product compares to others. They have a basic foundation of product, service or solution knowledge from intentional or accidental contact with source material. They know what they know and their knowledge base is well above zero. Advice for the Sales Professional. At this point in the buying process the buying influence is well ahead of the sales professional. They have created a mental image of the ideal solution. It’s not surprising to find that this mental solution often closely resembles their current solution. The “status quo” is often a powerful and comfortable option. Many buyers believe they know all the risks, costs and implications of remaining with their current supplier or solution. To determine if an opportunity exists, the sales professional must ask questions to understand what the buying influence knows, believes and feels so they can detect gaps that may offer an opportunity. 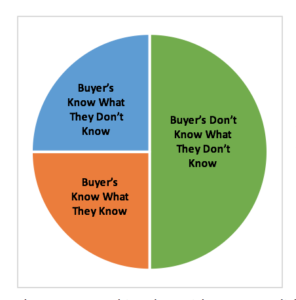 To what extent is what the buyer knows accurate, current, applicable and relevant? Most buying influences have conducted “due diligence” to confirm and update their knowledge but they often continue to harbor questions. They may be uncertain about many of the finer points in the literature. In other words, they “know what they don’t know” and they will have questions they want answered—along with data, testimonials and case studies. They will then use this information to verify “doing nothing” or re-define what the buyer believes is the ideal solution. Advice for the Sales Professional. It’s the seller’s job to help the buyer identify gaps and answer questions. Help them gain clarity and accuracy by providing timely and relevant information. Respect their diligence and willingness to ask questions. Listen carefully to what they are asking. Do they want to know history, capabilities, logic, acceptance in the market, failure rate, future pricing? Help them translate and connect what they need to know with what they already have learned or experienced. All of us have this shortcoming. Sometime a brief or limited exposure to an issue, product or solution leaves us with the false sense that we understand fully the business context. Left unaddressed, this poses a dangerous challenge to the selling process. To the savvy seller what the buyer “doesn’t know that they don’t know” can present a powerful opportunity. Early in the buying process, most buyers make assumptions about how much information is enough. This is an exciting opportunity for the seller to create value for the buyer. Sellers can help the buyer uncover previously unrecognized problems. Sellers can help the buyer recognize previously unanticipated solutions. Sellers can help the buyer envision unseen opportunities. Sellers can broker resources that were unknown to the buyer. It is in this area that sales professionals demonstrate credibility and differentiate themselves by providing new insights and a different perspective. Advice for the Sales Professional. Savvy sellers take the information they have gleaned from their discussion and begin to explore other areas that the buying influence may not have considered. They focus on insight that differentiates their product or solution. Sellers must ask thoughtful questions that get the buying influence to articulate implied or unstated needs. Buyers can then acknowledge, “I haven’t thought about that before and I can see that this must change.” Sales professionals can position their solution as the best alternative for addressing a problem, need or opportunity. Further, the seller can position themselves and their company to broker resources essential to what the customer wishes to fix, accomplish or avoid. Every buying influence goes through each of these phases as they begin to explore the need to change. Top producing sellers ask the best questions, make each buying influence think carefully while prompting action that favors the seller’s product, service or solution. Do you stand out by asking the right questions? Do you provide help that shapes the buyer’s perspective?